How It Works: The Molybdenum Disulfide contained in ZP-1000 Super Concentrated Moly Grease reduces friction and protects against excessive wear from extreme loads, galling and seizing. The moly “plates out” on metal surfaces, imparting extra protection to the parts and extending the lubrication cycle. ZP-1000 Super Concentrated Moly Grease is exceptionally resistant to most acids, salt spray, steam, dirt, dust, water, oxidation and weather. ZP-1000 Super Concentrated Moly Grease protects equipment indoors or outdoors even under high temperatures and heavy loads. 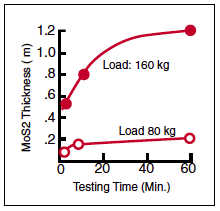 Some of the best answers for hostile conditions come through the findings when tests are conducted; the growth of film thickness as a function of load and time of a MoS2 containing grease, when plotted, shows that film thickness grows to 1.2 millionths of an inch and then stays constant. Tests have noted that once the film reaches a thickness of 1.2, no further detectable wear occurs with running time. What To Expect: As in the case of the Moon Lander, it moved to a site 250,000 miles away and it had to land itself when it got there. The home office can not send a maintenance man so you must be sure of your lubricant. 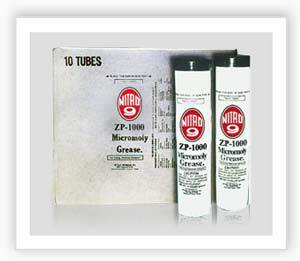 ZP-1000 Super Concentrated Moly Grease performs in a wide variety of temperatures. This is why the parts on the Lunar Moon Module were lubricated with ZP-1000 Super Concentrated Moly Grease. AT SEA – After an offshore drilling rig has been scoured by rough seas, ZP-1000 Super Concentrated Moly Grease will still be effective as the rig is jacked into place at 500,000 pounds per square inch on each gear tooth. ZP-1000 Super Concentrated Moly Grease lubricants can cut the downtime, parts costs and labor costs so critical to today’s operations by keeping the equipment operating on the job. IN THE GRIT – ZP-1000 Super Concentrated Moly Grease’s ability to stay put and subvert grit helps to extend lubrication intervals. The exceptional cohesive and adhesive properties of ZP-1000 Super Concentrated Moly Grease give it the ability to make a superior dust seal of its own and stay where the lubrication is needed. Special corrosion and rust inhibitors, excellent water resistance and extreme pressure properties help ZP-1000 Super Concentrated Moly Grease resist failure even on over-loaded applications. Directions: Pump in Moly Grease until all old grease is forced out. Technical: Gray Color – NLGI Grade 2 – Timken Load 65 – USDA Category H2Non Melt - 400° Flash Point - Reactivity Stable - Harmful if Ingested.